Home made dog treats recipes can be simple or complicated. 1) Do I want to start from scratch, which includes making the dough for dog biscuits and mixing the flour with supplements for dog cakes? There are some very involved recipes for the purists out there. To bake from scratch, you will have to know about additives in order to keep the dough from molding, and to make the recipe healthy. Do you know these things already? Are you interested in doing the research to learn more about baking? Are you taking a baking class and already know about additives and which ingredients can be mixed together and which cannot? 2) Or, are you more inclined to go the quick and easy route which involves opening up a package, adding water, maybe an egg, and then mixing it? In other words, you don't have to worry that you are including all the correct additives. (This is our choice! We follow the "I'm a Betty Crocker type of cook" motto - just give us the mix and directions, you do all the planning and thinking for us!" You may have to add an egg or oil or a specific flavoring, but the base mix is already prepared for you. There are pre-packaged biscuit mixes and cake mixes available that take all the guesswork and worry away. Party Time dog cake mix is perfect for a dog birthday cake. As a dog bakery, you will get a lot of requests for dog birthday cakes. Ask your customers which flavor is the dog's favorite. There are dog cake mixes in various flavors, or you can take a basic yellow cake mix or a dog cupcake kit and add any flavors into it that are desired. If a customer doesn't know, this party time mix is always a favorite. Dog biscuit mixes come in a variety of flavors as well. The biscuit mix performs well when placed into a silicone biscuit mold like the mini paw print shaped mold or the mini dog bone mold. If you feel too guilty simplifying your work this way, you can always roll out the biscuit dough and use bone shaped cookie cutters or other cutters to make special shaped biscuits and dog cookies. Click here for Dog Bakery Supplies. Try your home made dog treats recipes out on your own dogs and friends' dogs first. Experiment with different flavors for different smells. Decide if you will focus on a specific niche - all natural, organic, wheat free, etc. Depending on the type of treats you plan to make, your dog bakery supplies will follow. 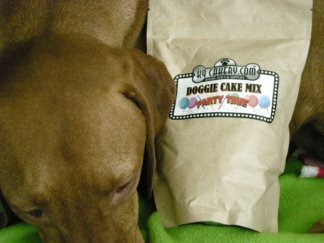 K9Cakery no longer carries the Doggie Party Time Cake Mix. See dog birthday cake recipe to get information on making this dog cake. The doggie biscuit mix is now available in plain or peanut butter flavor.